A non-profit community organization preserving and protecting Foster's Pond in Andover, MA. The 2019 Annual Meeting of the Foster's Pond Corporation will be held on Wednesday, May 8, from 7 to 9 p.m., in Memorial Hall Library. The public is cordially invited. Peatlands are natural flood controls, fascinating ecosystems, and storage bins for more carbon than all other vegetation types in the world combined. And, says Barry, Foster’s Pond offers an incredible diversity of peatland habitats whose size and complexity are unmatched in this region. Barry has a degree in Forest Ecosystem Science from the University of Maine. He interned in the Fern Valley Native Plant Collection at the US National Arboretum, and has extensive experience in commercial landscaping and nursery operations, focusing on sustainable, native landscapes in Northeastern Massachusetts. His presentation will include advice on gardening with native plants and creating rain gardens to protect the Pond. The presentation is a collaboration of Memorial Hall Library and the FPC. To save time, the Treasurer's Report and the minutes of the May 30, 2018, Annual Meeting and the August 19, 2018, Summer Meeting will not be read at the meeting. The Andover Conservation Commission approved a recommendation by the Corporation's lake management consultant to treat about 9 acres of the Pond this year to control fanwort. The Commission also okayed contingency plans to treat the Pond for blue-green algae and another invasive weed - spiny naiad - if they are found during the summer. The Commission's unanimous approval of the herbicide treatments came at its April 16 meeting. The fanwort treatment is expected to start in May, with two follow-up treatments spaced about a month apart. In addition, without taking a formal vote, Commission members warmly endorsed the Corporation's efforts to try some new non-chemical weed control techniques, including an experiment this year with diver-assisted suction harvesting. For more information and a map, click here. 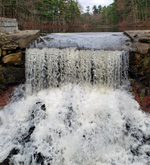 The Pond's iconic waterfall was fully restored as of April 23, marking the end of the 2018-19 winter drawdown. A 2.5-inch rainfall increased the flow over the Dam's 12-foot-wide spillway from a trickle, which had begun on April 17, to a cascade. The refill began on March 29. For more details and a picture, click here. Hydro-raking of ten shoreline properties started Monday, with the work expected to take about a week. On April 16, the Andover Conservation Commission approved a list of participants seeking a total of 35.5 hours of hydro-raking. Almost all of the hydro-raking was requested in the Main Pond, where eight shoreline owners asked for 32.5 hours. One property at the mouth of the Channel and one Azalea Drive property accounted for the remaining three hours. For more background on hydro-raking, click here. WCTV, Wilmington's non-profit community television station, has produced a 22-minute program devoted to Foster's Pond and the FPC. The "Where's Wilmington" show, hosted by Lisa Kapala, includes a tour of the Goldsmith Woodlands by long-time Pond resident Joan Ellis, interviews with FPC President Steve Cotton and Board Member David Adilman, and footage of the Pond, the Dam, and Goldsmith. To view the program, click here. Make Your 2019 Contribution Today! We can't protect Foster's Pond and our historic dam without your help. Check out our Honor Roll of Foster's Pond supporters who donated last year. Give now, so we can put your name on our 2019 roster of donors. Earn the coveted , identifying you as an especially generous donor! Please, go to our donation page right now and give on-line or by mail. Your contribution is tax-deductible. Thank you! We've treated Foster's Pond for toxic algae four out of the last five years. Can anything be done to prevent algae blooms? To find out, we commissioned a state-of-the-art study of the Foster's Pond watershed, using the latest computer modeling, on-line databases, and newly-assembled information. Our consultants delivered a Watershed-Based Plan for reducing the primary "limiting nutrient" that triggers algae growth. The first step is to give citizens of the watershed the information you need on how to protect the Pond. Start here. Amazon has introduced a charitable-giving program that lets you make donations to the Foster's Pond Corporation without spending anything beyond the price of what you purchase. Amazon's charitable foundation will simply set aside 0.5% of the purchase price and contribute that to the FPC. All you have to do is go through the AmazonSmile portal. Your Amazon account information stays the same, and everything available on Amazon.com is also available on AmazonSmile, at the same price. To get started, click here. Get the latest news about Foster's Pond. Want to be alerted when the Pond will be closed for a weed treatment? Or that an algae bloom has been detected? Or if there's an upcoming event? Then sign up to get Foster's Pond e-mail Updates. Updates are sent out about once a month. They will keep you informed without cluttering your in-box. And we don't share your e-mail address with anyone. Click here to subscribe.